If you're a fan of wacky sci-fi movies then prepare to be wowed because Playtech's Cowboys and Aliens is a mishmash of cartoon-style craziness. Taking inspiration from comedy science fiction hits such as Mars Attacks, Spaceballs and Galaxy Quest, the Cowboys and Aliens slot game doesn't take itself too seriously. 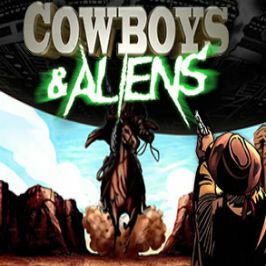 Playtech's Cowboys and Aliens slot machine is unashamedly outlandish, contradictory and fun. From the startled-looking vicar in his Stetson to the gun-toting hero and a bevy of horny (they've got horns) aliens, this game is eccentricity personified. 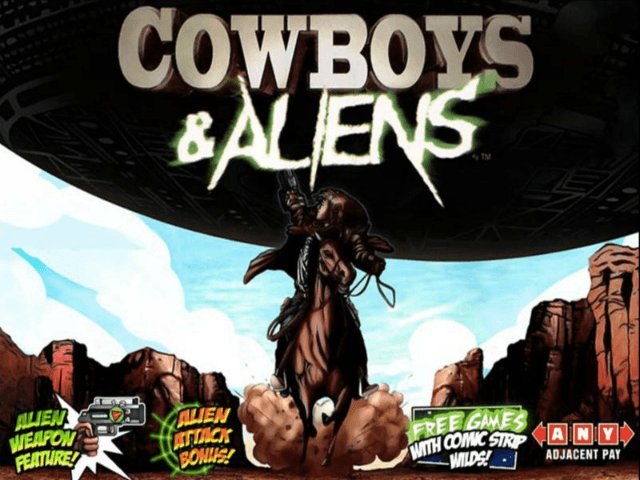 But fear not; we've created a Cowboy and Aliens slot guide that will ensure Playtech's playful game doesn't leave your head in a spin! Play Cowboys and Aliens for Real Money! 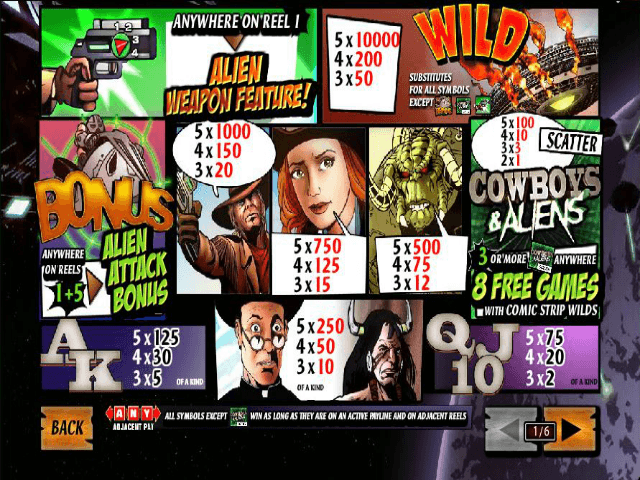 Cowboys and Aliens is an online slot game that takes the sci-fi theme and runs with it. This is not only evident in the cowboy/cowgirl and alien images, but the soundtrack. On the one hand, you'll hear harmonicas and acoustic guitars playing western riffs. While on the other hand you'll hear bleeps and synth sounds reminiscent of an alien spacecraft. This certainly helps to set the mood! Of course, you can't have a video slot that simply plays a few tunes. So, to ensure there's some substance behind Cowboys and Aliens' style, the Playtech development team has added a host of unusual ways to win. The Alien Weapon Feature: To help link the game's overall storyline to the action, an alien gun on reel one will set off a wild bonus. After landing in view, the gun will shoot its laser beam at random symbols and turn them into wilds. This in turn helps to create more winning combinations. Free Spins Bonus: Roll in three or more scatters (game logo) anywhere in view and you'll not only get eight free spins, but a giant wild. 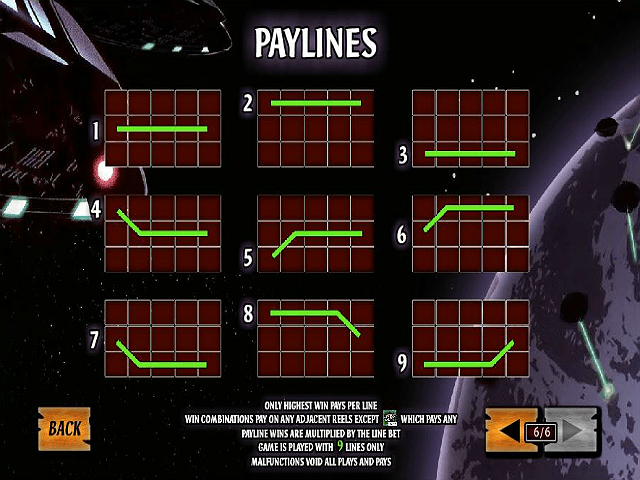 As the bonus round kicks into life, a rectangle will appear at random positions on the reels. Whatever area it covers will turn into a wild and give you more ways to win. Alien Attack Bonus: The last of the special features involves a fight for survival. After rolling in the bonus symbol on reels one and five, you'll be asked to pick one of three heroes: Verity, Zeke or the Indian Warrior. Once you've done that, your job is to shoot the aliens as they attack. Each kill will be worth a random cash amount, a multiplier or extra ammo so you can play for longer. At the end of the third attack, your bonuses will be credited to your account. Cowboys and Aliens is a great game if you're a fan of sci-fi and love an interactive bonus or two. Share this Cowboys and Aliens Review today! 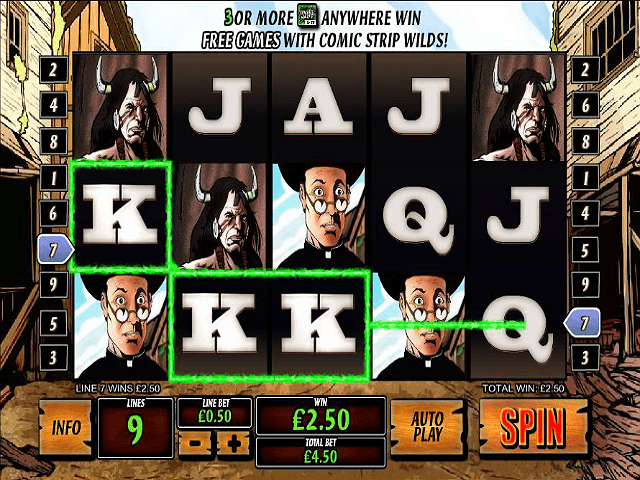 If you like Cowboys and Aliens, you'll love these slot titles too!